We saw a lot of kids and grown-ups dressed in orange today in our school, and I should not be a cynic who thinks wearing a t-shirt in a certain colour changes really not so much (there are some other actions of course..). So I won’t think that..(although a quasi-free dress day without the obligatory donation would help in an otherwise uniformed school, too..) I just think it’s a bit vague and does not go very deep. Who would be FOR bullies anyway? There has been no ‘autism awareness day’ (acceptance/month, whatever) in the school so far, and I have been explicitly told talking about autism might lead to bullying (..?) which basically only made me start this blog in September last year. So April is coming around and so far I don’t know what is planned, I don’t know what to think again, is it really just about donning a bit of blue and say “Autism!” for one day? What is your take on ‘awareness days’ vs actual action, information, education? Are you doing something in April ? 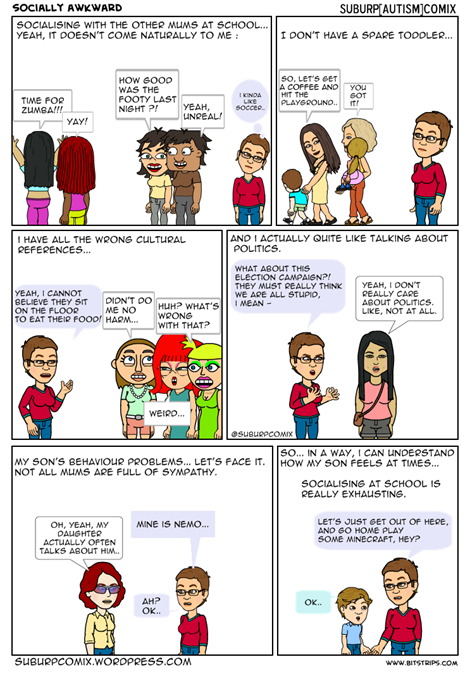 This entry was posted in Australia, autism, parenting, school and tagged ASD, asperger, asperger's, Australia, autism, autism advocacy, bullying, parenting, school, special needs, teacher on March 21, 2014 by starfish. This entry was posted in Australia, autism, parenting, school and tagged ASD, asperger's syndrome, Australia, autism, different, disability, expat, foreigner, immigrant, politics, school, special needs on October 12, 2013 by starfish. how he feels about school..
For most of it, we have found methods and tools. The other kids though, that’s a different problem.. 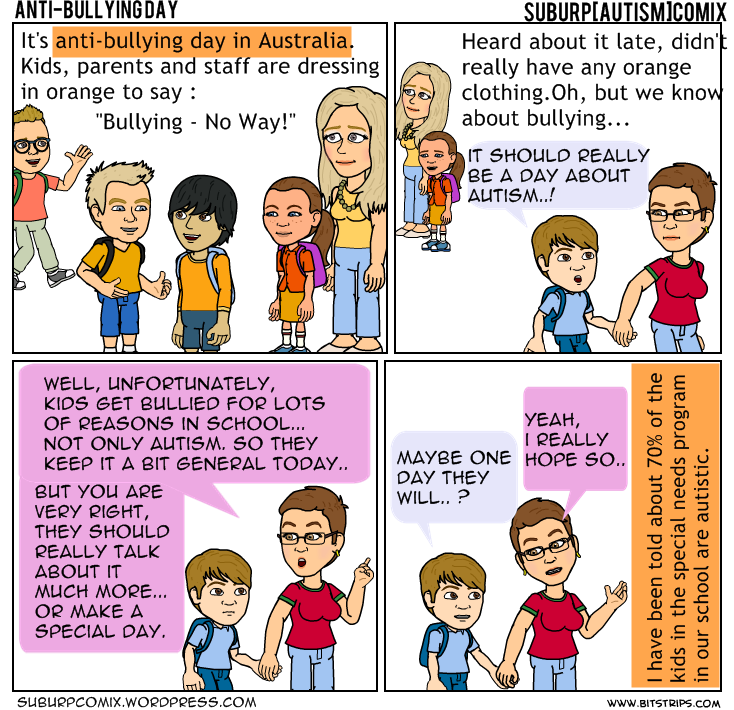 This entry was posted in autism, parenting, school and tagged anxiety, ASD, asperger's, Australia, autism, bullying, children, comic, friends, kids, peer pressure, scholarisation, school, socialising on October 9, 2013 by starfish. 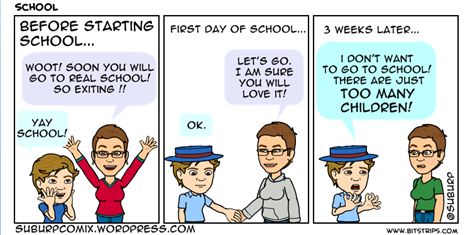 This is not an autism comic, although it was the one time my son got some “Respect!” of a ‘cool’ boy in his class. For his undies.. well. “Bonds” is an Australian underwear brand that is quite popular here. The commercials are clever, colourful and fun, and it’s seen as an Aussie icon. Pricewise it’s midrange, but for my 7yo, I shop for colours and comfort anyway, certainly not for brands. I thought it was pretty funny, my son had been told he’s got the ‘right’ undies on, when actually.. there were just some cheap brand from Kmart. This entry was posted in Australia, general, parenting and tagged Aussie, Australia, Bonds, boxers, brands, children, fashion, underwear, undies on October 7, 2013 by starfish.